Bitumen World, a road construction company from Zimbabwe is camped at Solusi for the next two weeks working on the Gwayi Bulawayo road. The construction team which is being led by Mr. Moyo who is the operations Administrator will start working on the road today 04 July, 2018. “We have been instructed by the Ministry of Transport and Infrastructural Development to work on the Gwayi-Bulawayo road and I promise you, the road will be done in 2 weeks,” said Moyo. 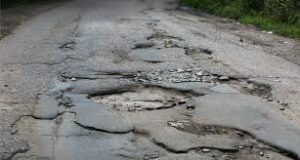 Solusi road has been deteriorating since 2010 which lead to very serious pot holes causing damage to many vehicles. The Vice-Chancellor Prof. Ephraim Gwebu hit the ground running having realised the road challenge and took with him a high powered delegation which consisted of the Acting Dean of Students Dr. Herbert Ndlovu and Dr. Keratilwe Gwebu to meet the Minister of Transport and Infrastructural Development Hon. Dr. Joram Gumbo in Harare. “We went to see the Hon. Gumbo to request for a better road for Solusi community. We believe that a better road than what we have now will ease our business with neighboring towns and cities. Right now it takes us a full hour to complete a 37km stretch because of the bad road,” said Prof. Gwebu. Dr. Herbert Ndlovu also commented on the development that is about to take place and thanked the Minister for covering the whole country in road service as far as his office is concerned. “The coming in of Bitumen World is an answered prayer to us as Solusi and the surrounding community. It shows that the Honorable Minister honoured our request and has everyone at heart regardless of their location,” said Dr. Ndovu. The new road will make a big difference to Solusi and the surrounding communities. Staff members and students will be able to commute in and out of town without any hassles. Those who wish to stay in town can drive every-day because of a better road network.